A hand-held fan is an implement used to induce an airflow for the purpose of cooling or refreshing oneself. Any broad, flat surface waved back-and-forth will create a small airflow and therefore can be considered a rudimentary fan. But generally, purpose-made hand-held fans are shaped like a sector of a circle and made of a thin material (such as paper or feathers) mounted on slats which revolve around a pivot so that it can be closed when not in use. The movement of a hand-held fan provides cooling by increasing the airflow over the skin which in turn increases the evaporation rate of sweat droplets on the skin. This evaporation has a cooling effect due to the latent heat of evaporation of water. Fans are convenient to carry around, especially folding fans. The above is from Wikipedia. It is amazing how a purely objective definition of something can take all the romance away. Below is a reprise of a blog of mine from January 6, 2010 called El Abanico. 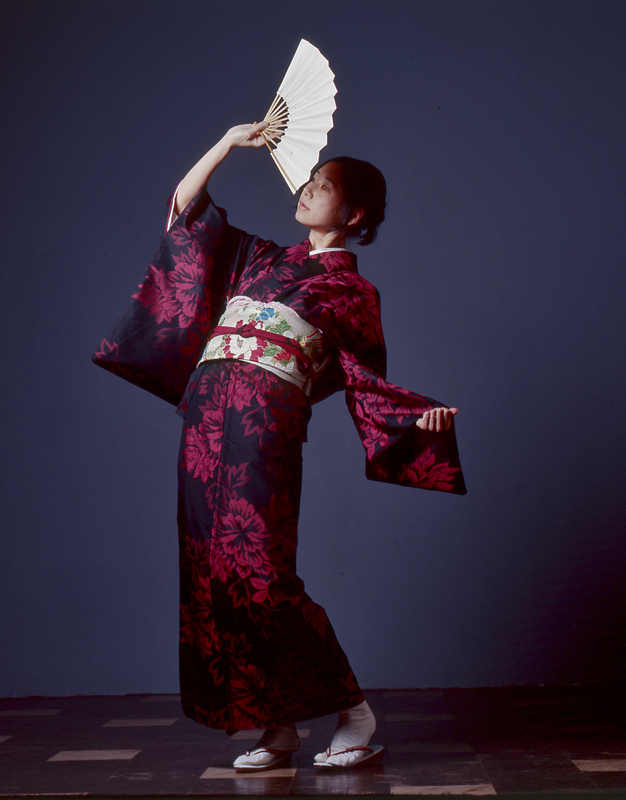 While looking at some of my files today I remembered my photographs of Helen Yagi and her Japanese fan. I found them more beautiful on this viewing and decided that a reprise of El Abanico could be a good thing. Si la mujer escondía los ojos detrás del abanico, estaba diciendo a su interlocutor que lo quería. If the woman hid her eyes behind the fan, she was saying to her would-be suitor that she loved him. Si colocaba el abanico sobre la mejilla izquierda, la respuesta era: No; y si lo posaba sobre la derecha, la respuesta era: Sí. If she placed the fan on her left cheek, the answer was: No; and if she placed it on the right cheek the answer was: Yes. Si la mujer se abanicaba con rapidez, significaba que estaba comprometida; y si lo hacía lentamente, le transmitía que estaba casada. 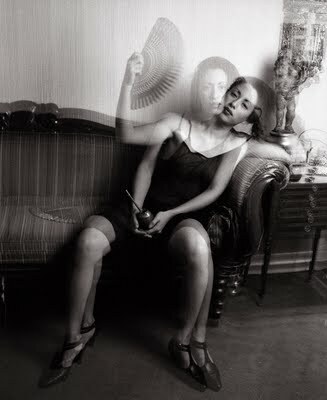 If the woman fanned herself quickly it meant that she was engaged; and if she fanned herself languidly, she indicated that she was married. 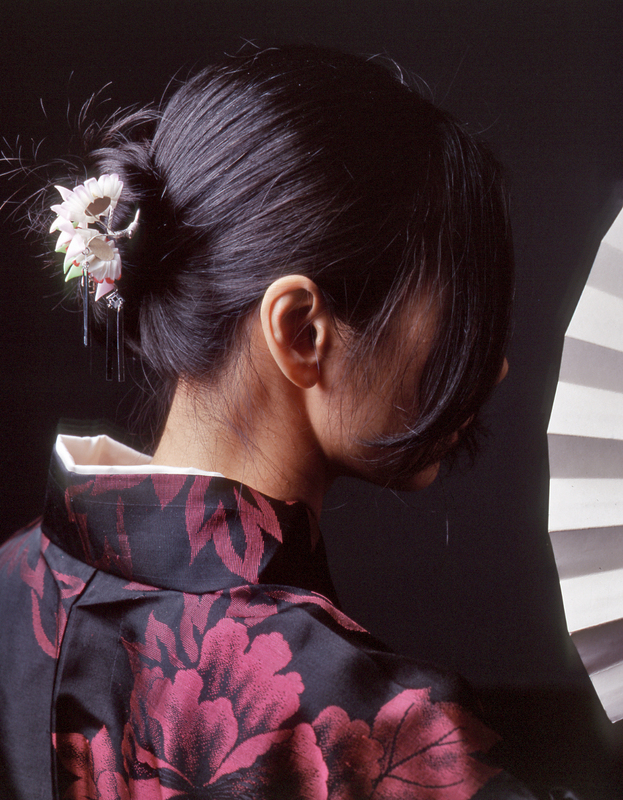 The foldable fan was invented in Japan in the 7th century. From there it spread to Europe where it was commercialized. It was particularly important to Spanish culture. From Spain the fan traveled to the Americas. It was and is primarily used by women although in some cultures men use it, too. In the 18th and 19th century the fan was widely mentioned in literature and was an important element in painting. 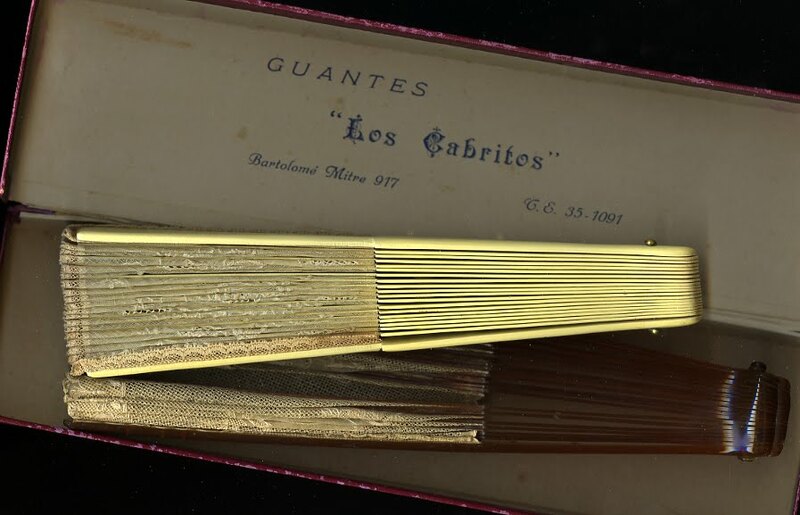 In Spanish literature of the 19th century and 20th century, especially in Seville and Granada, there are many references to be found on fan lore including the special significance on how women communicated with each other and with would-be lovers with the fan. Both my grandmother and mother who had been raised in the tropics of Manila were experts with their fans. They could close and open them with a deft flick of the wrist. It made a little noise, a swish that seemed to me magical. Even though I attempted to master the skill (I believe it is an art) I failed. Every once in a while I like to open the two sandalwood chests (and smell the inimitable fragrance that I relate to an exotic past of my family in the orient). The chests (my grandmother called them "my camphor babies") have been part of our family since the early 30s. I like to open the various little cardboard boxes (Spanish or Argentine chocolate boxes and here an Argentine cardboard glove box ) that contain my grandmother and mother’s fans. Some are from Spain and some from the Philippines. There is a very beautiful one from the Philippines of turtle shell and the cloth material is a delicate but tough fiber called jusi which is made from Chinese silk. 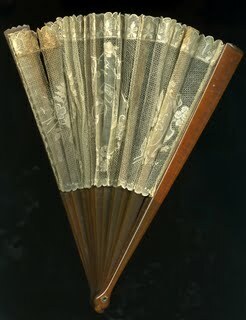 This fan was my great aunt’s, Buenaventura Galvez Puig. A few years after she died my mother and her younger sister Dolly argued as to who was going to inherit the beautiful fan that had Buenaventura's initials in diamonds and emeralds (you can see where they were on the upper right hand side of the fan). My mother graciously (smart in my opinion) suggested that Dolly could have the jewels and she (my mother) would keep the fan. Dolly immediately pried them out. The fan’s jewels have been long pawned but I (via my mother) still have the fan. The word for fan in Spanish is abanico which is a diminutive of abano which comes from the Portuguese. The verb abanar in Spanish is used when one is describing, as an example, fanning a fire. 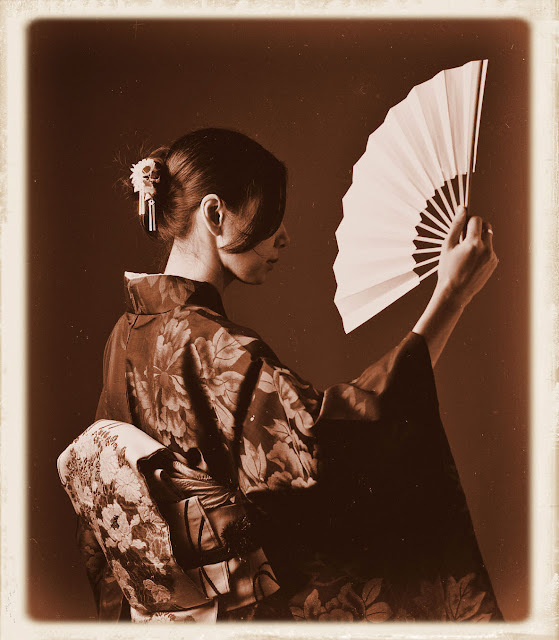 But if one fans oneself with a fan (an abanico) the verb is the beautiful sounding abanicar. Me abanico (I fan myself). Or, “Amor, abanícame.” My love, fan me. The first alternating current electric fans came into use in 1891. Spaniards and Argentines call this “new” and modern development a ventilador. Mexicans may be a bit more conservative or simply just more romantic as they call electric fans abanicos. The very Argentine Linda Lorenzo seen here was most competent at flicking her fan open and closing it.